This prop is actually a "Building Block". 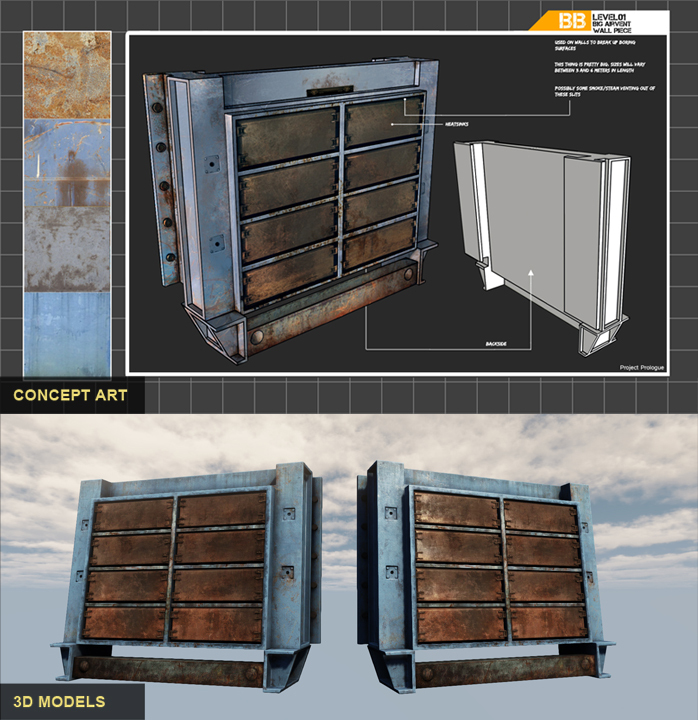 We use these kind of objects to quickly and efficiently bring detail to the environment. Being one of the largest objects in the game, it required quite a bit of detail-mapping (overlaying repetitive generic detail over the texture) to get it to look sharp and believable from up close. The purpose of this object can be easily justified; just a big air vent. 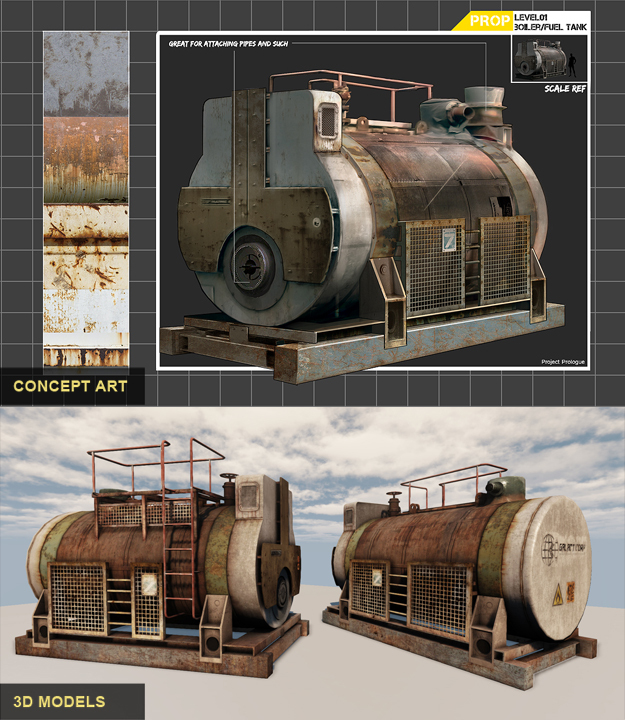 One of the first props to have been modeled and put ingame. Starting a project as a modeler with a relatively small and meaningless object gives you a simple warm-up for what's to come. The prop itself needed a distinguishable shape when lit, so two bars were put in front of it to give it a nice little industrial sci-fi finesse. Two building blocks under one conviniently grouped name! It's like twins. 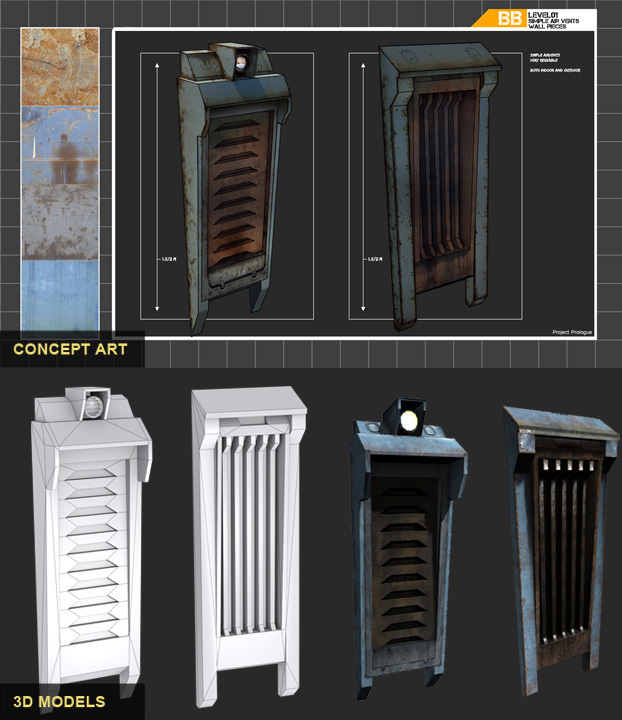 Unlike the Big_Airvent we needed something small for placement on empty parts of walls or slopes. These guys will help out by that. The first one actually has a little lightbulb at the top, so we can even use them as some kind of light source. Probably the first prop to have been modeled and put ingame. The design is quite generic, so that this one had higher chances to suit a somewhat different approach to the art style. It can be used as a place for cover, but if you're really enthousiastic you can just as well climb on top of it.